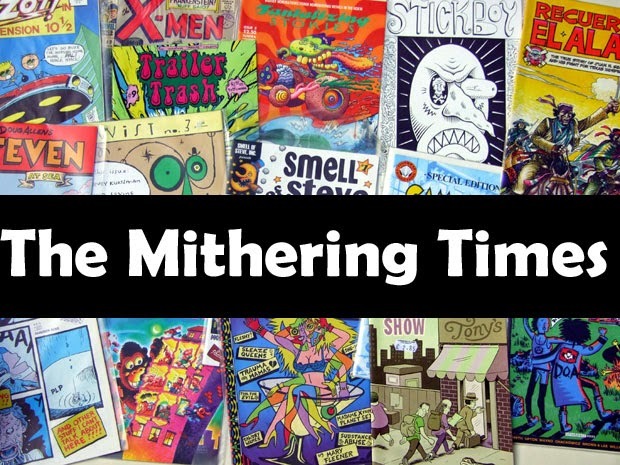 the mithering times: Time Bomb High School. booktemp1, originally uploaded by mithering. We Never Learn. The Gunk Punk Undergut, 1988-2001 - Eric Davidson. A review. It's fair to say that the vast majority of the bands featured in this book will mean next to nothing to 99% of the music-consuming publics, but for me it represents a confirmation that every dog eventually has its day. More so than seeing Urge Overkill or Sonic Youth on Top of the Pops - that was achieved through major label sponsorship and for those singles the pursuit of 'novelty', more so than the eventual arrival of John Waters' queer trash sensibilities smack in the middle of 'normal' culture - My High School Hairspray, anybody? It's almost not worth listing the bands or trying to codify an approach or rationale for their individual trajectories (always, always down, it must be said) because writer Eric Davidson is trying to lasso together a pool full of jerking, slipping, sliding electric eels. 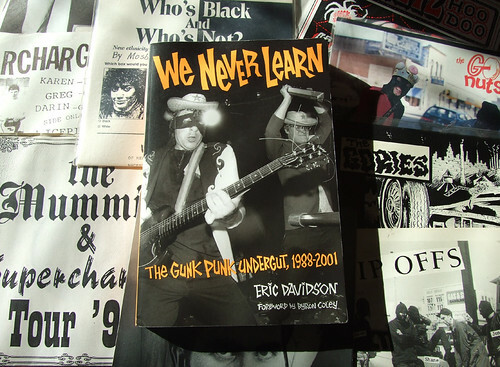 To explain, this book is two things; a brief history of The New Bomb Turks, a great punk rock band from Columbus, Ohio who were mainly active in the 1990s, and the chronicling of a non-scene Davidson has seen fit to label Gunk Punk. To be fair, apart from a transparent rush to the end of the book when it seems he's not really all that interested in the bands he is writing about but his professionalism demands that they are highlighted, it is the only time he is wrong-footed. One can only assume that Gunk Punk, a non-term, came from an editorial / publishing decision intended to give Joe Public a label to attach to this motley bunch of scenes, bands, towns, promoters, labels, fanzines, arseholes, losers, smackheads and drunks. That's the small print out of the way; the book itself is magnificent. Well, magnificent in the way that a book about DIY bands on tuppeny ha'penny labels in Buttfuck, Minnesota can be. It's extremely comprehensive - I was mired in this scene in the early 90s, publishing four issues of Moral Sense, a fanzine which had (mainly) US garage punk running throught its veins, and I've been hard-pressed to find many glaring omissions or playings down of reputation (personally, I'd like to have seen a tiny bit more about The Phantom Surfers who, despite playing surf music, personify the fun, stupid, basic approach which characterises much of this music). All the 'major' players are either interviewed or mentioned; Gories, Oblivians, Supercharger, Estrus Records, The Mummies, Supersuckers, In The Red, The Devil Dogs, Crypt Records, The Gibson Brothers, The Dwarves ... oops, I promised no list-making was necessary. Davidson highlights the influence of the Back from the Grave compilations of the trashier end of the 60s US garage punk scene and their 70s counterparts, Killed By Death, on the bands he has written about and its clear that those compilations, along with the economic reality of not being able to afford the good studios or slick producers, contributed to the bluntness of a lot of this music. It's also clear that most of the good stuff was in the past by the time there was a 'garage' boom fuelled through NME coverage in the earlier part of the century. Distance from the roots led to a lot of pretty weak stuff masquerading as garage, or the lionising of fairly unoriginal (and that in a scene where non-originality could sometimes be regarded a badge of honour) bands who would previously have been confined to the backwaters. Anyhow, you can judge for yourself to a degree, because there's a free twenty-song download with this book which includes some great stuff. The book also has an index; Lucas, Michael - tick, Long Gone John - tick, White, Jason - tick, Balcarcel, Raul - not included. The greatest band of all in that scene, the never-missed Fingers are relegated to footnote status in an interview with Jason 'Sheer Filth' White. There are also lists of the best fifty singles and the best one hundred LPs (surely it should have been the other way round) and while Davidson misses a trick (again) by omitting The Fingers from the singles list, he makes up for it by confirming that, of the fifty listed, the best of all is 'Teenage Love Bomb' by Australian slop-kings The Dirty Lovers. It's a pretty shallow book, but that's because it tries to cover so much ground. A book that mentioned Ralph/Raul and the Fingers would have to have a pretty small focus. But you know what? I'd probably enjoy it more, since it would have more info I didn't already know.